It’s no secret I have a strained relationship with David Chang and his restaurants, though a quick search reveals that I’ve never actually discussed that fully here. Maybe the glaring lack of posts about his places – due to my not visiting them – speaks volumes, but really, there’s more to it. I’ve never met David – the one time I saw him in person, back in 2006 during opening week at Ssam Bar, he scurried back in the kitchen when I peered at him – but have read enough interviews with him and articles about him to determine that he and I would unlikely be friends if we ever did meet. His attitude about certain things and the way he sees some things… just don’t jibe with who I am and how I see things. Unfortunate, because I’ve met his pastry chef, Christina Tosi, several times now, and find her absolutely wonderful, lovely, super talented (her baked goods are about the only things I buy from the Momo Empire, ever), and just a great person all around. Her, I could be friends with. Not so unfortunately, I haven’t really enjoyed my dining experiences at Momo establishments in the past, so I didn’t feel like I was missing much by not visiting more of them as they opened. But I recently needed a place appropriate for a business meeting, not too fancy, not too casual, and Má Pêche fit the location criteria as well. I sucked it up and decided to give it a go. 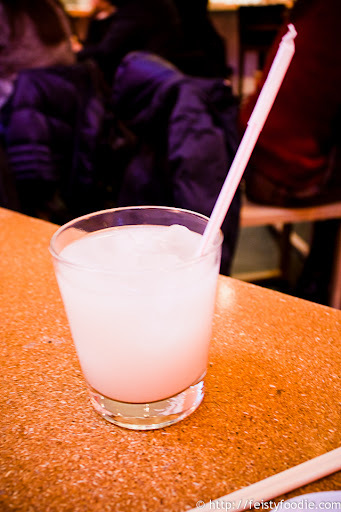 When I see horchata on a menu, I can’t help but order it – even at a non Mexican restaurant. It was only okay – a touch chalky – but I wasn’t expecting much. The famous pork buns – you really can’t go to a David Chang establishment that offers these and not order them, and my dining partner suggested we get both types of buns. Um, yes! so we ordered the fish buns as well. The pork buns were delicious – honestly, I took one bite and was like oh, so this is why people rave about them. 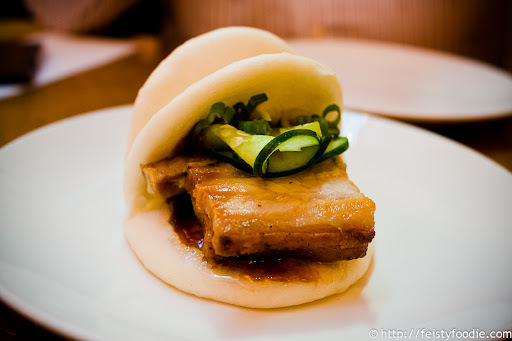 The soft, pliable bread – yes, mantou like any other simple peasant bread – giving way to the slightly crisp, sweet and fatty pork belly, coupled with the hoisin sauce and crisp cucumbers… it was an excellent combination of textures and flavors that worked very, very well together. The fish buns were also delicious – shredded lettuce, very crisp, freshly fried whitefish, and a touch of sauce slicked on the bottom to bring everything together, this was another combination of textures and flavors that really just went perfectly together. Of course, it was almost unfair to try to eat the fish buns directly after enjoying the pork buns. Not that you’d try to compare the two – very different, with just the same basis for inspiration I imagine – but given the choice, I’d choose the pork belly, every single time. For my main course, as it was a cold, windy day, I chose the duck ramen with miso, bok choi and xo sauce. Completely contrary to what I’d just experienced with the buns, I found this entirely too mediocre. Everything was just OK – middling. The noodles weren’t overcooked as I expected, based on reviews of Noodle Bar from friends who’d been, but they weren’t anything special, either. The duck was OK. The broth was OK. Everything was just OK. Suitably tasty, but not for that price and not particularly special. Yvo says: This hasn’t really changed my mind about David Chang, and I doubt I’ll make a special trip to return – even for the delicious pork buns. However, I might be less resistant to visiting one of his establishments when friends suggest it in the future – especially if I know for sure the pork buns are on the menu. *Bonus: as you walk exit, you can stop by the counter in the front to pick up Milk Bar treats – like the amazing bagel bomb, yum. Never been, but I do have a fondness for pork buns and duck. The pork buns are really good. More pork buns are coming in tomorrow’s post! The pork buns look delicious! I’m sure it would be good with crisp duck skin as well. Mmm… I’ve heard that one of the downtown locations does a duck bun actually… that sounds really good. The pork buns look great, as expected. 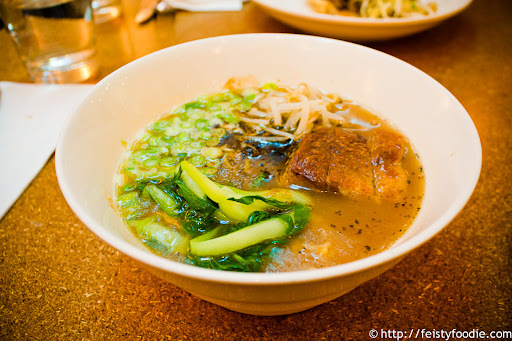 As for the ramen, I understand – sometimes so much hype only leads to an average meal. Actually, I’ve never heard anything good about David Chang’s ramen, so this surpassed my expectations in that regard. As for hype in general – I completely agree. I’ve been to several of his restaurnats: Ko, Ma Peche, Ssam Bar, and various Milk Bar treats. Never had the ramen though. Weird. The pork buns, I agree are very good and one of the best in the city that I’ve had. PS: Rounding out the Momo’s with fried chicken dinner at Noodle Bar in a couple of weeks. I’ve never been to Noodle Bar either. I have friends that used to love it but would talk about how the noodles were mushy – they just liked the buns.